Little Black Dress Worthy says it all about this stunning necklace! 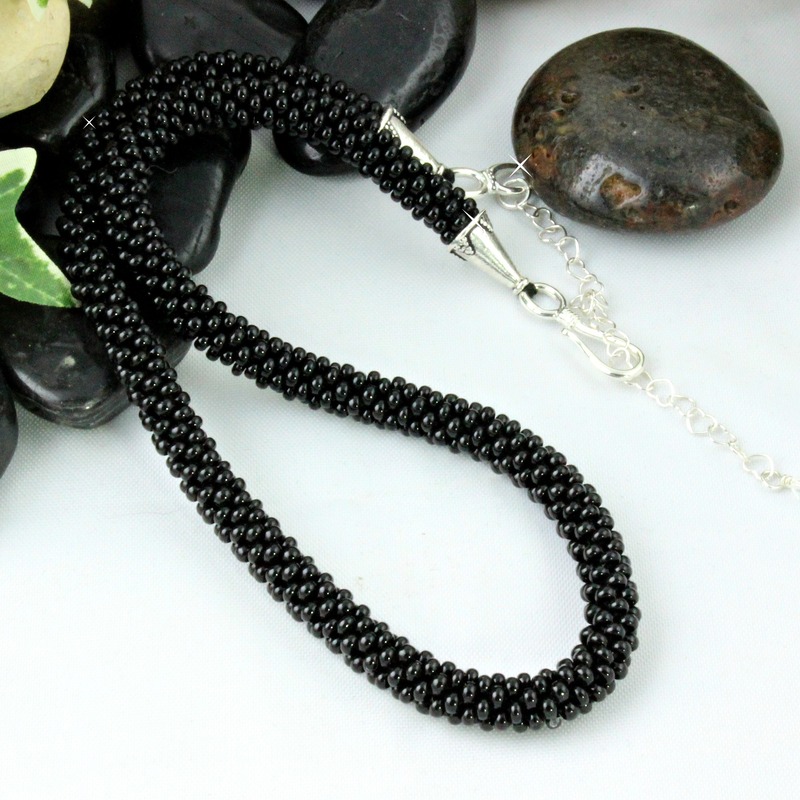 Glossy black seed beads hand crocheted into a necklace that will get more than its fair share of compliments every time you wear it! Elegant worn by itself… Stunning with any Shugies pendant. Go ahead…pamper yourself with a Little Black Dress Worthy Necklace! Ever had trouble getting your necklace hooked in back of your neck? Or your favorite necklace isn’t the right length for that neckline? Easy S hook clasp – No lobster claw! I start each necklace by stringing approx 950 seed beads on quality French made pearl cotton crochet thread. Each tiny bead is strung on by hand. Then the crocheting begins! This necklace has been completely hand crocheted by me. Finished with cones at each end that are .999 pure silver bonded over a copper core. The heart chain that allows the necklace to be adjustable is Sterling Silver. A genuine Swarovski crystal attached at the end of the chain finishes each necklace. Go Ahead … Pamper yourself with a hand crocheted necklace! Are you looking to start your Shugies Jewelry collection? Or add to your Shugies Jewelry case?? Monthly drawing for pendants, earrings and more!